Phillip Hansen is a graduate of University of the Arts with a B.M. in Instrumental performance. If you've visited the store in the past, you may have had the chance to work with him as an employee at the front counter. At this point, he's joined the formidable roster of private teachers in our Marlton store, focusing on saxophone and clarinet. Phil began his musical journey in 4th grade on saxophone, and was a student of one of the local band programs. 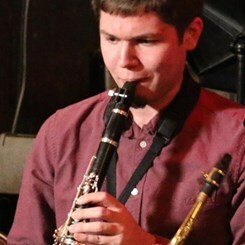 School band and other musical experiences led him to high school, where he began to take a heavier interest in music, particularly Jazz and how it relates to saxophone. He went on to study with the superb faculty at UArts (composed of many of Philadelphia's top musicians), and shared the stage with world-class performers. At this time, Phil performs with a variety of different kinds of groups and settings, from styles ranging from Classical, to Jazz, Rock, Funk, RnB, Soul, and even Electronic. Phil utilizes a variety of techniques to teach musical concepts with and without the instrument. He also likes to use the instrument as a means to connect to the player's own musical tastes, whether it differs from standard repetoire, or not. Phil's experiences have proven to him that music is fluid, and can assume many forms. His students work towards a technical understanding of the instrument, a working knowledge of music's fundamentals, and a willingness to approach music in a variety of ways.